NYS OASAS, in partnership with The National Center on Addiction and Substance Abuse at Columbia University (CASAColumbia), developed the LOCADTR 3.0 Concurrent Review Module (CRM). This web-based tool is used by substance abuse treatment providers, Medicaid Managed Care plans, and other referral sources to determine the most appropriate level of care for a client with a substance use disorder. 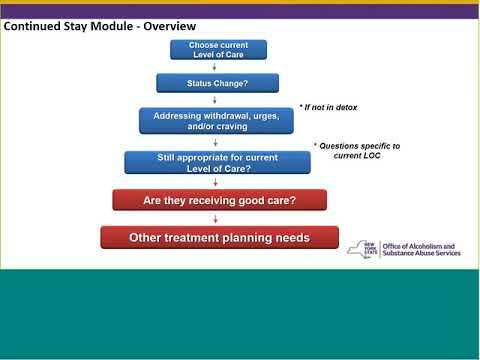 Providers use the concurrent review module when making or considering level of care changes from one level of care to another level of care. This webinar gives an overview and walk through of this module.